Since the mid-1970s I've presented lectures on renewable energy before groups of all sizes from all walks of life in the United States, Canada, Chile, Denmark, Germany, France, Great Britain, Ireland, Italy, Spain, Fiji, New Zealand, and Australia. "I have known Paul for several years and have attended a number of his presentations. Interesting, contemporary, factual, dynamic and inspiring are some of the adjectives that come immediately to mind for his talks. 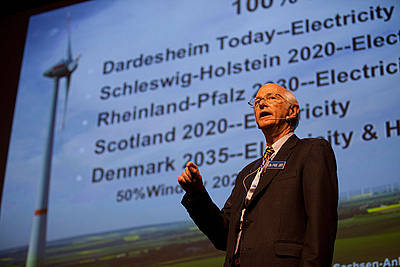 Paul ranks among the top few people who really know what is going on in wind energy throughout the world." --Jim Salmon, meteorologist with Zephyr North, Ontario, Canada, September 26, 2001. Note: I no longer provide a complete list of previous engagements. If you would like to know who I've worked with recently, please contact me directly.